Pandoc outputs HTML without any styling. That’s boring and ugly. This is some simple CSS for stand-alone Pandoc documents that serves as a good default. Regardless of how your compose your document, we’ll make it look good. This should work with markdown, reStructuredText, textile, LaTeX, MediaWiki markup, or any other format Pandoc supports. 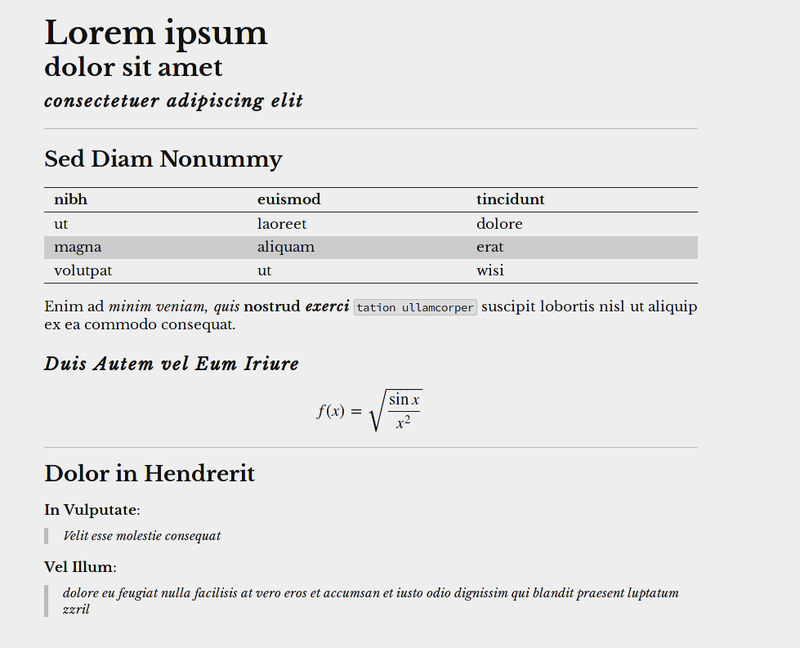 It should even work for your semantically structured HTML5 documents, if they’re written well enough. We focus on modern web standards, and target Pandoc’s html5 output target. We use Libre Baskerville, a screen-optimized font based on Baskerville, and Adobe’s free Source Code Pro for all our text. Webfonts are loaded through Google’s Webfonts service, so you don’t have to worry about hosting a dozen woff, otf, svg, and eot variants. In case the user’s browser doesn’t support CSS3’s @font-face directive, we fall back to sane defaults. To improve readability, wide responsive margins are used with justified text. Experimental CSS4 hyphenation is used on browsers that support it, reducing the effects of rivers. Clean horizontal rules are used to section off top-level headers. Styling is provided for h1, h2, and h3 tags, as well as Pandoc’s title extension for markdown. CSS’ sibling selectors are used to collapse duplicate horizontal rules to ensure clean transitions between trouble elements, such as h1 and table. Pandoc’s markdown supports multiple syntaxes for tables. Vertical lines destroy table readability. Our tables use only horizontal rules and alternating shading between even and odd rows, improving comprehension. There’s all sorts of possible edge-cases, so we have a collection of example documents that we automatically build and then review by hand before each release. Upgrading shouldn’t break semantic documents.